I’m growing it again, and it’s looking good thus far. 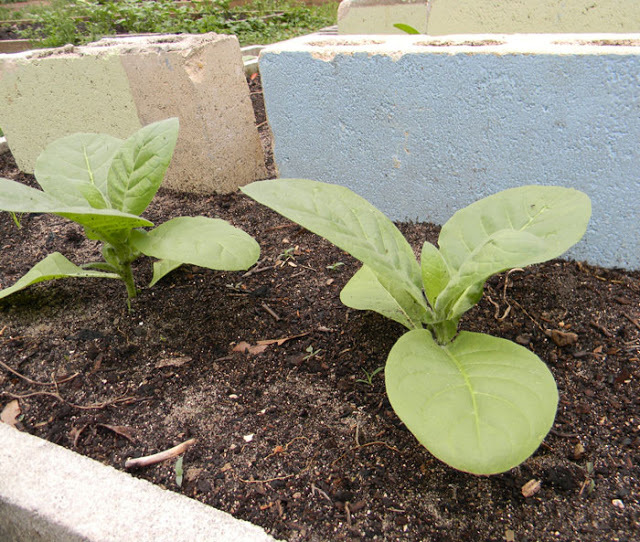 This year, however, instead of growing my “Havana” strain, I’m trying out one called “Florida Sumatra,” which is on the tobacco page at www.seedman.com. This variety is supposed to air-dry into a nice smokeable leaf. Some of my previous experiments with rolling cigars (okay, ALL of my previous experiments with rolling cigars) have been unsatisfactory. I’m hoping the larger leaves on this cultivar may prove more amenable to my limited rolling skills. Even if not, it’ll still be worth chewing or packing into a pipe. May the Force be with you! I recently moved to Putnam County, so I'll be very interested in hearing how this turns out for you. Yeah… imported cigars are expensive, for the most part. The best place to buy them is through http://www.famous-smoke.com/. That's my go-to place. Your husband is right on the curing side of things, unfortunately for all of us. It's a time-eating, touchy process, much like making a good wine or scotch. My tobacco, even when dried and hung up for a year, usually has a weird sweetness mixed with burning oak leaf flavor. Not at all like a nice Punch or La Gloria Cubana cigar. One day I may learn to cure it properly. Life is a lot easier for cigarette smokers. Sun dry and puff away.